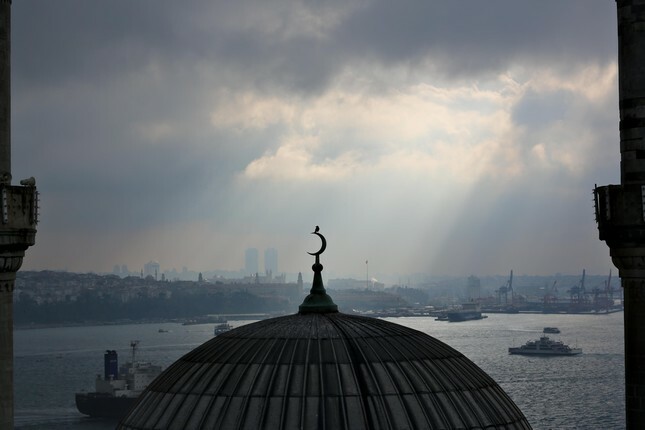 Famed Turkish author Orhan Pamuk will hold an exhibit spotlighting an array of photos of Istanbul taken from his own balcony, his publisher said on Wednesday. The exhibition "Balkon: Photos by Orhan Pamuk" consists of pictures of "subtle and ever-changing view of Istanbul" taken by the 66-year-old Nobel Laureate from his balcony in late 2012 and early 2013, said Yapı Kredi Culture and Arts Publishing. Curated by Gerhard Steidl, the German publisher of his photo book Balkon, the exhibit opens next Wednesday and runs through April 27 at the Yapı Kredi Culture and Arts building on Istanbul's teeming Istiklal Street. The statement quoted Istanbul native Pamuk saying of the vantage point from his balcony: "There is something in this view which reflects my own state of mind and reveals the ineffable but profound emotions running through me." The exhibit features more than 600 photos selected from over 8,500 taken by Pamuk using a telephoto lens over a five-month period, "a period of intense creativity," according to the statement. The show, shaped by Pamuk's desire to "record" the sight in front of him, offers a panoramic view of the city, the Bosporus, the Golden Horn, the Sea of Marmara, the Princes' Islands, crisscrossing boats and gliding birds, the statement added. Taking photographs unexpectedly became a tonic to Pamuk's writers' block, according to the publisher Yapı Kredi. "I felt the need to look at the view over and over again-or, more accurately, to take photographs of it-because I was finding it so difficult to write," Pamuk was quoted as saying. Pamuk said that the view from his balcony "invited me to seek quietude and introspection, to let go of material concerns in favor of more intellectual pursuits." Although initially reluctant to share his photos with others, Pamuk later realized "they were not merely records of the landscape but also of his soul," the statement added. Pamuk's books have been translated into over 60 languages and sold more than 2 million copies worldwide. His books "My Name Is Red" and "Snow" became the most translated and read Turkish works in history. In 2012, Pamuk opened the Museum of Innocence in a nineteenth-century house in Istanbul, as a companion to his novel of the same name. In 2014, it won the European Museum of the Year Award. When Pamuk won the Nobel Prize in Literature in 2006, the Swedish Academy said: "In the quest for the melancholic soul of his native city, he has discovered new symbols for the clash and interlacing of cultures."